R.J. Tilley specializes in plumbing and remodeling services in the Goochland, VA area. 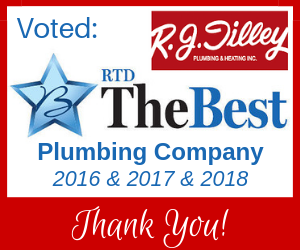 For the past 40 years, R.J. Tilley has served central Virginia homeowners with high quality, professional plumbing services. Over time, our services have expanded beyond plumbing to also include kitchen and bathroom remodeling. With a full staff of trained plumbers and carpenters, no job is too big for us to handle. Whether you want to convert your appliances to gas, or simply need a new gas line installed for your outdoor grill, our gas fitters are licensed and insured to handle all gas conversions. If it’s time for you to upgrade your hot water system, let R.J. Tilley guide you through all the options. Water heater regulations have changed over the years. Depending on your model of choice, it may require more space for installation. Our skilled and certified team installs various types of water heaters including electric, gas, hybrid, and tankless water heater systems. Tankless systems are very efficient and are available in gas or electric models. Are clogged drains slowing your flow? R.J. Tilley can help! Our team can quickly identify the cause of a clog and will use the proper tools to quickly clear clogged drains and get them flowing smoothly again. In some cases, we use video inspection services to identify the source of a clog and to inspect the integrity of your drain pipes or sewer line. For over 20 years we’ve been providing bathroom and kitchen remodeling to ensure our customers are living comfortably. We’ll take care of everything including painting, sheet rock, electrical, flooring, tile and cabinetry. Need inspiration and design ideas for your bathroom or kitchen remodel? Visit our showroom. Our team understands that the safety and comfort of your home depends on efficient, reliable systems. From emergency repairs to installation and maintenance, we can fix that! Contact RJ Tilley today—we look forward to serving all your plumbing, heating and remodeling needs!